Canadian cyclist and 2012 Giro d'Italia champion Ryder Hesjedal on Wednesday admitted to doping "more than 10 years ago" after allegations surfaced in a book written by disgraced Danish cyclist Michael Rasmussen. Ryder Hesjedal on Wednesday admitted to doping "more than 10 years ago" amid allegations from disgraced Danish cyclist Michael Rasmussen, who wrote in his new book Yellow Fever that the Victoria native used banned products, including EPO, dating back to the 2003 season. "I have loved and lived this sport but more than a decade ago, I chose the wrong path," said Hesjedal in a statement released by his representative, Slipstream Sports. "Even though those mistakes happened more than 10 years ago, and they were short-lived, it does not change the fact that I made them and I have lived with that and been sorry for it ever since." Rasmussen, who was pulled by his Rabobank team prior to the 2007 Tour de France over missed tests leading up to the race, said Hesjedal took doping advice from him because of the Canadian’s desire to compete in the 2004 Athens Olympics. In his book, Rasmussen also writes that two other Canadians, SeamusMcGrath and Chris Sheppard, received advice. "A good result in the world championships  could send them to the Olympics in Athens in 2004," Rasmussen wrote. "They moved into my basement in August, before I went to the Vuelta a Espana, and right after I had ridden the Meisterschaftvon Zurich. There, they stayed around 14 days' time. I trained with them in the Dolomites and taught them how to [make] vitamin injections and how you took EPO and Synacthen [cortisone]." The CBC hasn't verified any allegations in the book. An apologetic Hesjedal, 32, released the following statement Wednesday: "To everyone in my life, inside and outside the sport, to those that have supported me and my dreams, including my friends, my family, the media, fans, my peers, sponsors, to riders who didn't make the same choices as me all those years ago, I sincerely apologize for my part in the dark past of the sport. I will always be sorry." Earlier Wednesday, Hesjedal's father expressed support for his son, no matter the allegations. "It's time to move forward," Len Hesjedal told CBC News in Victoria. "It's what's happening today that's important. It's not what happened 10, 20 years ago." When asked about possible drug use by his son in the past, Len Hesjedal said: "I am saying Ryder is a person of his own and you'll have to talk to him." Erythropoietin, or EPO, is a hormone that boosts the body's amount of oxygen-rich red blood cells. It was banned in 1990 but the International Cycling Union did not begin a urine test for it until 2001. EPO is the same substance disgraced American cyclist Lance Armstrong was accused of using. In January, Armstrong admitted to doping, including EPO, and the UCI stripped him of his seven Tour de France titles and barred him for life. On Wednesday, Cycling Canada expressed its concern, stating the allegations towards Hesjedal, Sheppard and McGrath "are another example of why the international federation (UCI) needs to come to an agreement with [the World Anti-Doping Agency] on a way to deal with such allegations of historic doping. "The WADA code has a statute of limitations of eight years. As such, even if these three athletes admitted to these allegations, this information in and of itself, would not result in anti-doping rule violations. "Cycling Canada has always taken a strong stance against doping and we wish to reiterate that doping has no place in our sport. Those that break the rules will be punished to the fullest extent allowed by the anti-doping regulations." "We continue to urge any athletes that have information about doping in the sport to come forward to the CCES to help with the ongoing fight against doping." Retired Canadian cyclist Michael Barry said in a statement, "Ryder's admission to having used performance enhancing drugs only reinforces the need for a truth and reconciliation process. The culture in professional road cycling has changed greatly. The sport is now much cleaner than it was six years ago but for the culture to change completely, transparency must be encouraged. Riders, staff and officials must not fear speaking the truth. When they do, real reforms will follow." For the past several months, Cycling Canada says it has been working with the Canadian Centre for Ethics in Sports "to get to the heart of the use of performance-enhancing drugs in Canadian cycling." “As has been publicly reported, we can confirm that USADA, along with the Canadian Centre for Ethics in Sport (CCES), interviewed cyclist, Ryder Hesjedal, earlier this year as part of our ongoing investigation into the sport of cycling. Athletes like him, and others, who have voluntarily come in, taken accountability for their actions and have been fully truthful, are essential to securing a brighter future for the sport of cycling. As in all cases, where there is actionable evidence of doping within the statute of limitations, we have imposed discipline and announced sanctions. Hesjedal, who wrapped up his season on Sept. 15 with a third-place performance at the UCI Grand Prix Cycliste de Montreal, said he's "deeply grateful to be part of an organization" in Slipstream Sports "that makes racing clean its first priority and that supports athletes for telling the truth." Earlier in the month, he finished 60th in the Tour of Alberta, the largest and mostly highly ranked bike race ever held in Canada. Crashes and health problems derailed his goals for the season. In July, Hesjedal fractured a rib in the opening stage of the Tour de France, where he finished a career-worst 70th overall. An upper respiratory infection ended his bid to defend his 2012 Giro d’Italia title while he crashed out of his comeback Tour de Suisse race in the early stages after suffering a heavy blow to the neck and head in a fall during the third stage. 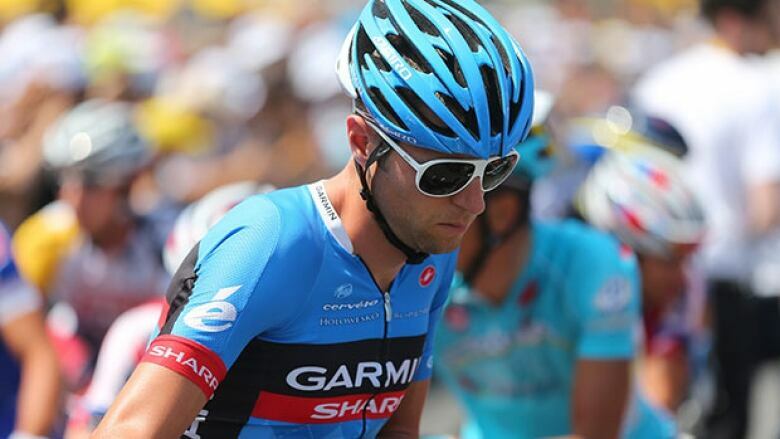 Hesjedal is signed with the Garmin Sharp team through 2015.